The DirectFeedthrough property has been removed. Delete all instances of this property in your MATLAB® code. For more details, see Compatibility Considerations. The dsp.VariableFractionalDelay System object™ delays the input signal by a specified number of fractional samples along each channel of the input. The object can also concurrently compute multiple delayed versions (taps) of the same signal. For an example, see Signal Delay Using Multitap Fractional Delay. The object interpolates the input signal to obtain new samples at noninteger sampling intervals. You can set the InterpolationMethod property to 'Linear', 'FIR', or 'Farrow'. The object supports time-varying delay values. That is, the delay value can vary with in a frame from sample to sample. You can also specify the maximum value of the delay by using the MaximumDelay property. Delay values greater than the maximum are clipped to the maximum. Create the dsp.VariableFractionalDelay object and set its properties. vfd = dsp.VariableFractionalDelay creates a variable fractional delay System object that delays a discrete-time input by a time-varying fractional number of sample periods, as specified by the second input. vfd = dsp.VariableFractionalDelay(Name,Value) creates a variable fractional delay System object with each specified property set to the specified value. Enclose each property name in single quotes. Method of interpolation, specified as one of the following. Using this method, the object interpolates the signal to obtain new samples at noninteger sampling intervals. 'Linear' –– The object uses linear interpolation. 'FIR' –– The object implements a polyphase FIR interpolation filter to interpolate values. 'Farrow' –– The object uses the LaGrange method to interpolate values. For more details on these methods, see Algorithms. Half-length of FIR interpolation filter, specified as a positive integer in the range [1 65535]. For periodic signals, a larger value of this property, which indicates a higher order filter, yields a better estimate of the delayed output sample. A property value of 4 to 6, which corresponds to a 7th-order to 11th-order filter, is usually adequate. This property applies only when you set the InterpolationMethod property to 'FIR'. Length of the FIR filter implemented using the Farrow structure, specified as an integer greater than or equal to 2. If the length equals 2, the filter performs linear interpolation. The filter length value determines the order of the polynomial used for lagrange interpolation. This property applies only when you set the InterpolationMethod property to 'Farrow'. Number of interpolation points per input sample at which a unique FIR interpolation filter is computed, specified as a positive integer in the range [2 65535]. Normalized input bandwidth at which to constrain the interpolated output samples, specified as a real scalar in the range (0 1]. A value of 1 equals the Nyquist frequency, or half the sampling frequency, Fs. Use this property to take advantage of the bandlimited frequency content of the input. For example, if the input signal does not have frequency content above Fs/4, you can specify a value of 0.5. Initial values in the memory of the object, specified as a scalar or an array. The dimensions of this property can vary depending on whether you want fixed or time-varying initial conditions. The object treats each of the N input columns as a frame containing M sequential time samples from an independent channel. To specify fixed initial conditions, specify InitialConditions as a scalar value. The object initializes every sample of every channel in memory using the value you specify. The dimensions you specify for time-varying initial conditions depend on the value of the InterpolationMethod property. When InterpolationMethod is set to 'Linear', specify InitialConditions as a 1-by-N-by-D, where D is the value of the MaximumDelay property. When InterpolationMethod is set to 'FIR' or 'Farrow', specify InitialConditions as a 1-by-N-by-(D+L) array, where D is the value of the MaximumDelay property. For FIR interpolation, L is the value of the FilterHalfLength property. For Farrow interpolation, L equals the floor of half the value of the FilterLength property: floor(FilterLength/2). Maximum delay that the object can produce for any sample, specified as an integer in the range [0 65535]. The object clips input delay values greater than MaximumDelay to that maximum value. Action taken for small input delay values when the object uses the FIR interpolation method. Action taken for small input delay values when the object uses the farrow interpolation method. For more details, see rounding mode. 'Same word length as input' –– The object specifies the coefficients word length to be the same as that of the input. The fraction length is computed to get the best possible precision. 'Custom' –– The coefficients data type is specified as a custom numeric type through the CustomCoefficientsDataType property. For more information on the coefficients data type this object uses, see the Fixed Point section. Coefficient word and fraction lengths, specified as an autosigned numeric type with a word length of 32. This property applies only when you set CoefficientsDataType to 'Custom'. 'Same as first input' –– The object specifies the product polynomial value data type to be the same as that of the data input. 'Custom' –– The product polynomial value data type is specified as a custom numeric type through the CustomProductPolynomialValueDataType property. For more information on the product polynomial value data type this object uses, see the Fixed Point section. This property applies when you set InterpolationMethod to 'Farrow'. Word and fraction lengths of the product polynomial value, specified as an autosigned numeric type with a word length of 32 and a fraction length of 10. This property applies only when you set InterpolationMethod to 'Farrow' and ProductPolynomialValueDataType to 'Custom'. 'Same as first input' –– The object specifies the accumulator polynomial value data type to be the same as that of the data input. 'Custom' –– The accumulator polynomial value data type is specified as a custom numeric type through the CustomAccumulatorPolynomialValueDataType property. For more information on the accumulator polynomial value data type that this object uses, see the Fixed Point section. Word and fraction lengths of the accumulator polynomial value, specified as an autosigned numeric type with a word length of 32 and a fraction length of 10. This property applies only when you set InterpolationMethod to 'Farrow' and AccumulatorPolynomialValueDataType to 'Custom'. 'Same as first input' –– The object specifies the multiplicand polynomial value data type to be the same as that of the data input. 'Custom' –– The multiplicand polynomial value data type is specified as a custom numeric type through the CustomMultiplicandPolynomialValueDataType property. For more information on the multiplicand polynomial value data type that this object uses, see the Fixed Point section. Word and fraction lengths of the multiplicand polynomial value, specified as an autosigned numeric type with a word length of 32 and a fraction length of 10. This property applies only when you set InterpolationMethod to 'Farrow' and MultiplicandPolynomialValueDataType to 'Custom'. 'Same as first input' –– The object specifies the product output data type to be the same as that of the data input. For more information on the product output data type, see Multiplication Data Types and the Fixed Point section. Word and fraction lengths of the product data type, specified as an autosigned numeric type with a word length of 32 and a fraction length of 10. This property applies only when you set ProductDataType to 'Custom'. 'Same as first input' –– The object specifies the accumulator data type to be the same as that of the data input. For more information on the accumulator data type this object uses, see the Fixed Point. Word and fraction lengths of the accumulator data type, specified as an autosigned numeric type with a word length of 32 and a fraction length of 10. This property applies only when you set AccumulatorDataType to 'Custom'. 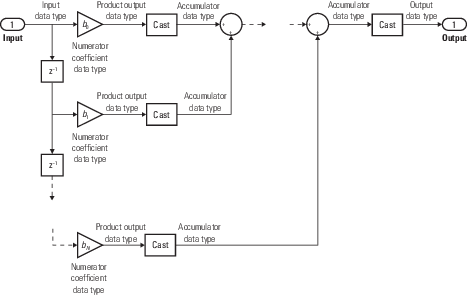 'Same as accumulator' –– The object specifies the output data type to be the same as that of the accumulator output data type. 'Same as first input' –– The object specifies the output data type to be the same as that of the data input. For more information on the output data type this object uses, see the Fixed Point section. Word and fraction lengths of the output data type, specified as an autosigned numeric type with a word length of 32 and a fraction length of 10.
vfdOut = vfd(input,d) delays the input to the variable fractional delay System object by d samples. d must be less than or equal to the value you specify in the MaximumDelay property of the object. Delay values greater than the specified maximum delay are clipped appropriately. Each column of the input is treated as an independent channel. Data input, specified as a vector or matrix. The data input must have the same data type as the delay input. This object supports variable-size input signal. That is, you can change the input frame size (number of rows) even after calling the algorithm. However, the number of channels must remain constant. For an example, see Variable-Size Signal Support for Input and Delay Signals. Delay input, specified as a scalar, vector, matrix, or N-D array. The delay can be an integer or a fractional value. When the delay input is a fractional value, the object interpolates the signal to obtain new samples at noninteger sampling intervals. The delay input must have the same data type as the data input. This object supports variable-size delay signal. That is, you can change one or both of the dimensions of the delay signal after calling the algorithm. However, the object must make sure that the resulting number of output channels remains constant. For an example, see Variable-Size Signal Support for Input and Delay Signals. The table shows the effect of the dimension of the delay input on the data input. N-by-1 (one channel with frame size equal to N) 1-by-P N-by-P P taps per channel. Each column in the output is a delayed version of the input. The delay value is specified by the corresponding element in the delay input vector. N-by-1 (one channel with frame size equal to N) N-by-P N-by-P P taps per channel. In addition, delay varies within each frame from sample to sample. N-by-L (L channels with frame size equal to N) N-by-1 N-by-L Delay value varies within the frame from sample to sample. Same set of delay values for all channels. N-by-L (L channels with frame size equal to N) N-by-L N-by-L Delay value varies within the frame from sample to sample. Different delay values for each input channel. N-by-L (L channels with frame size equal to N) 1-by-1-by-P N-by-L-by-P L channels. P taps per channel. Same delay for all channels. N-by-L (L channels with frame size equal to N) 1-by-L-by-P N-by-L-by-P L channels. P taps per channel. Delay varies across channels. N-by-L (L channels with frame size equal to N) N-by-1-by-P N-by-L-by-P L channels. P taps per channel. Delay varies within the frame from sample to sample. Same set of delay values for each channel. N-by-L (L channels with frame size equal to N) N-by-L-by-P N-by-L-by-P L channels. P taps per channel. Delay varies within the frame from sample to sample. Different set of delay values for each channel. Delayed output, returned as a vector or matrix. The size, data type, and complexity of the output match the size, data type, and complexity of the data input. N-by-L (L channels with frame size equal to N) 1-by-1-by-P N-by-L-by-P L channels. P taps per channel. Same tap for all channels. N-by-L (L channels with frame size equal to N) 1-by-L-by-P N-by-L-by-P L channels. P taps per channel. Taps vary across channels. 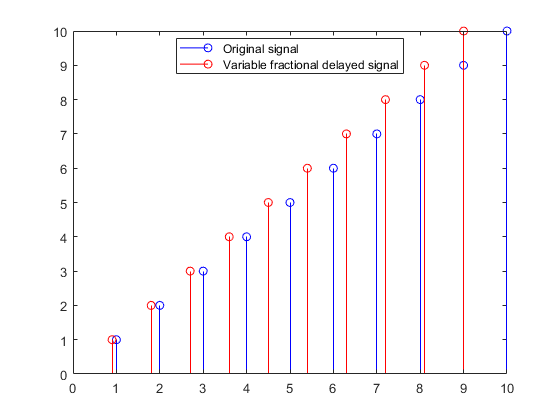 Delay a signal by a varying fractional number of sample periods. The output sigd corresponds to the values of the delayed signal that are sampled at fixed-time intervals. To plot the time instants at which the amplitudes of signal samples are constant, treat the signals as the sampling instants. Delay the input signal using the dsp.VariableFractionalDelay object. Each delay value is unique and can vary from sample to sample within a frame, and can vary across channels. You can compute multiple delayed versions of the same input signal concurrently by passing a delay input with the appropriate dimension. Consider the input to be a random signal with one channel and a frame size of 10. Apply a delay of 4.8 and 8.2 samples concurrently. Each channel in the output is delayed by 4.8 and 8.2 samples, respectively. The object uses the 'Linear' interpolation method to compute the delayed value. For more details, see 'Algorithms' in the dsp.VariableFractionalDelay object page. For the same delay vector, if the input has 2 channels, each element of the delay vector is applied on the corresponding channel in the input. To compute multiple delayed versions of the two-dimensional input signal, pass the delay vector as a three-dimensional array. The third dimension contains the taps or delays to apply on the signal. If you pass a non-singleton third dimension (1-by-1-by-P), where P represents the number of taps, the same tap is applied across all the channels. Pass the delays [4.8 8.2] in the third dimension. delayVec is a 1-by-1-by-2 array. Pass the two-dimensional input to the dsp.VariableFractionalDelay object with this delay vector. outcase3(:,:,1) represents the input signal delayed by 4.8 samples. outcase3(:,:,2) represents the input signal delayed by 8.2 samples. The same delay is applied across all the channels. In addition, if you pass a non-singleton second dimension (1-by-L-by-P), where L is the number of input channels, taps vary across channels. Apply the delay vectors [2.3 3.5] and [4.4 5.6] to compute the two delayed versions of the input signal. outcase4(:,:,1) contains the input signal delayed by the vector [2.3 3.5]. outcase4(:,:,2) contains the input signal delayed by the vector [4.4 5.6]. To vary the delay within a frame from sample to sample, the first dimension of the delay vector (N-by-1-by-P or N-by-L-by-P) must equal the frame size of the input (N-by-L). Pass a delay vector of size 10-by-1-by-2. Delay varies across each element in a channel. Same set of delay values apply across all channels. delayVec(:,1,1) applies to the first delayed signal and delayVec(:,1,2) applies to the second delayed signal. dsp.VariableFractionalDelay System object supports variable-size input and delay signals. That is, you can change the dimension of the input signal and the delay signal even after calling the algorithm. You can change the dimensions of one or both the signals simultaneously. Together, they must make sure that the number of output channels (number of columns) remains constant. The number of samples in each frame of the input signal can change. However, the number of input channels must remain constant. The output frame size (number of rows) changes according to the input frame size. The number of output channels in each of these cases is 1. To change the number of input channels, release the object. Call the algorithm with a two-channel input and vary the input frame size in subsequent calls. In addition to the input, the delay signal can also vary. That is, you can change one or both of the dimensions of the delay signal after calling the algorithm. However, the object must make sure that the resulting number of output channels remains constant. The delay signal can be a scalar, vector, matrix, or an N-D array. In each of these cases, the number of output channels is 2. To apply different delays on the input signal, release the object. The output in each of these cases is [256 7], [512 7], [100 7], and [100 7], respectively. When you specify a fractional delay value, the algorithm uses a linear, FIR, or Farrow interpolation method to interpolate signal values at noninteger sample intervals. For noninteger delays, at each sample time, the linear interpolation method uses the two samples in memory nearest to the specified delay to compute a value for the sample at that time. i-vi –– Distance, in samples, between the current index and the nearest point in the interpolation line. The variable fractional delay stores the Dmax+1 most recent samples received at the input for each channel, where Dmax is the maximum delay specified. U represents the stored samples. In the FIR interpolation mode, the variable fractional delay stores the Dmax+P+1 most recent samples received at the input for each channel, where P is the specified interpolation filter half-length. Clip to the minimum value necessary for centered kernel –– The FIR interpolation method remains in use. The small input delay values are clipped to the smallest value necessary to center the kernel. Switch to linear interpolation if kernel cannot be centered –– Fractional delays are computed using linear interpolation when the input delay value is less than P-1. In the FIR interpolation mode, the algorithm implements a polyphase structure to compute a value for each sample at the specified delay. Each arm of the structure corresponds to a different delay value. The output computed for each sample corresponds to the output of the arm with a delay value nearest to the specified input delay. Therefore, only a discrete set of delays is actually possible. The number of coefficients in each of the L filter arms of the polyphase structure is 2P. In most cases, using values of P between 4 and 6 provides you with reasonably accurate interpolation values. The designMultirateFIR function designs the FIR interpolation filter. The algorithm then implements this filter as a polyphase structure. Increasing the filter half length (P) increases the accuracy of the interpolation, but also increases the number of computations performed per input sample. The amount of memory needed to store the filter coefficients increases too. Increasing the interpolation points per sample (L) increases the number of representable discrete delay points, but also increases the simulation's memory requirements. The computational load per sample is not affected. The normalized input bandwidth from 0 to 1 allows you to take advantage of the bandlimited frequency content of the input. For example, if you know that the input signal does not have frequency content above Fs/4, you can specify 0.5 normalized bandwidth to constrain the frequency content of the output to that range. You can consider each of the L interpolation filters to correspond to one output phase of an upsample-by-L FIR filter. Therefore, the normalized input value improves the stopband in critical regions and relaxes the stopband requirements in frequency regions without signal energy. In Farrow interpolation mode, the algorithm uses the LaGrange method to interpolate values. The order of the polynomial used for the interpolation is based on the number of data points used in the Lagrange interpolation. This value is specified in the FilterLength property. To specify the behavior when the input delay value is too small to center the kernel (less than – 1), use the Farrow small delay action setting. Clip to the minimum value necessary for centered kernel –– The algorithm clips small input delay values to the smallest value necessary to keep the kernel centered. This option yields more accurate interpolation values. Use off-centered kernel –– The fractional delays are computed using a Farrow filter with an off-centered kernel. The results for input delay values less than – 1 are less accurate than the results achieved by keeping the kernel centered. When the length of the farrow filter is 2, the filter performs linear interpolation. The DirectFeedthrough property has been removed in R2018a. Trying to modify this property causes an error. Make sure you remove all references to this property from your MATLAB code. The dsp.VariableFractionalDelay object now operates in direct feedthrough mode by default. The diagrams in the following sections show the data types used within the dsp.VariableFractionalDelay object for fixed-point signals. Although you can specify most of these data types, the following data types are computed internally by the object and cannot be directly specified on the object interface. When the input is fixed point, all internal data types are signed fixed point. The following diagram shows the fixed-point data types used by the Linear interpolation mode of the variable fractional delay algorithm. The following diagram illustrates how the variable fractional delay object selects the arm of the polyphase filter structure that most closely matches the fractional delay value (vf). The following diagram shows the fixed-point data types used by the variable fractional delay algorithm in the FIR interpolation mode. You can set the coefficient, product output, accumulator, and output data types in the object. 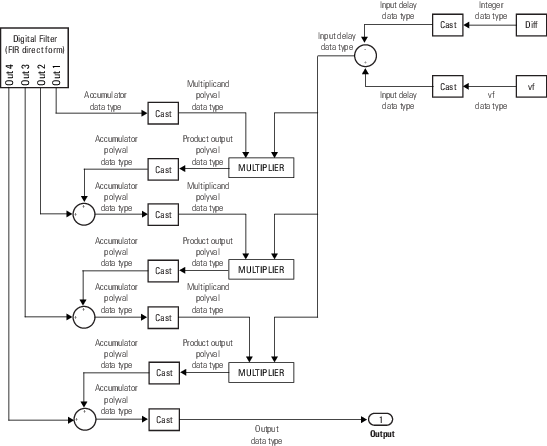 This diagram shows that input data is stored in the input buffer with the same data type and scaling as the input. The object stores filtered data and any initial conditions in the output buffer using the output data type and scaling that you set. When at least one of the inputs to the multiplier is real, the output of the multiplier is in the product output data type. 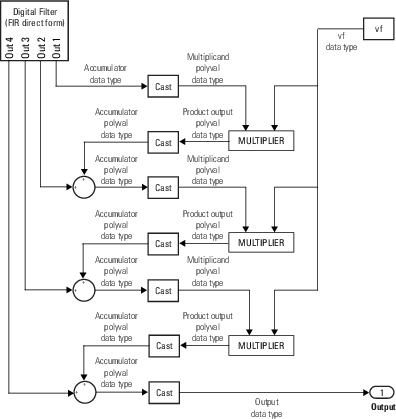 When both inputs to the multiplier are complex, the result of the multiplication is in the accumulator data type. For details on the complex multiplication, see Multiplication Data Types. The following diagram shows the fixed-point data types used by the FIR direct form filter.